Every year, Quench profiles Canadian chefs who are contributing that elusive something to the food scene, helping to change it, helping it to evolve. This year’s lineup is (often unintentionally) helping to define Canadian cuisine, which is no mean feat. 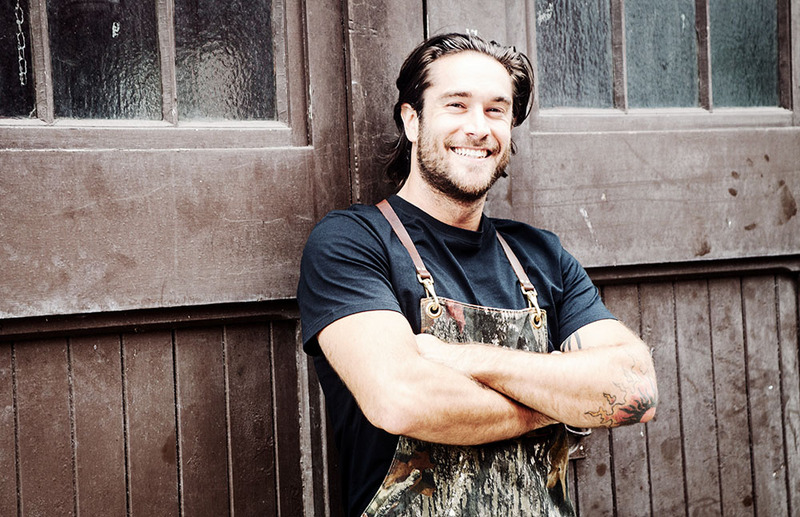 Michael Hunter at Antler Kitchen and Bar in Toronto melds wild, foraged ingredients and game meats with his European-inspired style and technique to craft dishes that showcase Canada’s natural products. Chef Michael Hunter is probably one of the only Mav Chefs on this list who is actively trying to define Canadian cuisine. His passion for nature, and all it has to offer Canadians, is evident when you speak with him. He’s a regular forager, gathering ingredients for the restaurant, and a hunter. Everything on his menu is game-based (meat), local/seasonal (produce) or foraged (fungi, berries). If you usually order the steak or chicken, then you won’t find these options on his menu. Try bison or Cornish hen instead. Antler Kitchen and Bar’s culinary theme is “Canadiana”; Hunter showcases contemporary Canadian cuisine with flavours from Ontario, Quebec and even British Columbia. He is transforming familiar dishes — like Jamaican patties, gyoza and even burgers — into local creations. I’ve always loved food. So, even as a kid, I just loved to eat. As I got older, I just really liked trying new things. And then, as I got into cooking professionally, I really fell in love with organic gardening and foraging for wild food and hunting, just because it tastes so much better than what you buy at the grocery store. What exactly does it mean to forage for ingredients? My take on it is: I go to the woods and pick. Right now, wild leeks are coming into season. So, we go pick wild leeks, bring them to the restaurant and serve them. We pick morel mushrooms, pheasant back mushrooms, wild ginger, cedar, sumac, watercress, wild mints. All these things we go and pick ourselves. So, that’s foraging. We’re not growing it; we’re finding it in the woods. Is there a sustainability concern? You have to make sure don’t pick too much? Yeah, definitely. Wild leeks are a big one. They banned it in Quebec, because they don’t grow back very well. [But] in Ontario there’s no law against harvesting wild leeks. There are definitely things you need to know when foraging certain things. Why do you forage instead of buying ingredients? It’s really strange. It’s a bit of a primal urge thing — satisfaction. It’s fun. I love being in nature, I think about my menu when I’m out in nature. I take my kids; it’s a family outing. I take my partner — she comes along with me. It’s very therapeutic to be in nature as opposed to a fast-paced crazy restaurant. So, it’s kind of just … my therapy. But also, it tastes great. Mushrooms that are picked that morning — you can’t buy them that fresh. A lot of them you can’t find in a grocery store. There are certain kinds of mushrooms that don’t keep well to sell. There’s a mushroom called inky caps that starts to liquefy after 24 hours; they turn to mush. They’re very rich in flavour. Cooking with them is great: they taste rich and creamy like Campbell’s mushroom soup, but they’re just natural wild mushrooms without any cream. Why did you specifically choose to incorporate those foraged ingredients, game meats and that wild aspect into your menu? It’s really just what I love to eat. For me, when you cook what you love, it tastes better. You know, you’re passionate about it. Our whole brand is Canadiana, wild food, forest to table. And for that to be authentic, we have to use those ingredients. Canada’s a very unique country in terms of food because our immigration is so huge. Our cuisine has turned into a bit of a melting pot. Which is really cool. But I think the Canadian food scene has a young identity. My take on it is: I’m born and raised here, and I’m highlighting the ingredients that are only from Canada. I love to eat avocados but I don’t serve them at my restaurant because we’re highlighting Canadian producers, farmers and foragers. So, we’re using, I would say, about 90 percent only Canadian products in the restaurant. A lot of those are regional Canada — we buy our wild fish from BC and the east coast, and also the Great Lakes. Our bison comes from Alberta, our deer comes from Ontario, our rabbit and wild boar come from Ontario. So, we’re just highlighting Canadian ingredients and farmers. What would be at the core of Canadian cuisine? For me, it is the game, because that’s what I believe our ancestors ate. A lot of communities in Northern Ontario and in the territories, all they eat is game meat. Their families hunt to sustain themselves and that to me — for them — that’s Canadian cuisine. My freezer is full of duck and deer, turkey, rabbit — and that’s what we eat at home. That’s my Canadian cuisine. What is the biggest influence on your cooking style? My cooking background is sort of a blend of French and Italian techniques. I trained with guys from the Stratford Chefs School, which is heavily rooted in French cooking. Various places I’ve worked have been French and Italian cuisine. I definitely use French and Italian recipes and techniques and influences, which are also a big part of Canadian culture. So, you take the essence of Canadian cuisine — game, local — and you apply these types of cooking methods to the ingredients? Yeah, I’m cooking something sous vide; I’m braising things; I’m serving rabbit with pasta. There’s lots of Italian dishes with rabbit and pasta, but we’re using local rabbit and local vegetables in that dish. So, it’s kind of a mash-up between my cooking background and Canadian ingredients. Definitely some kind of soulful stew. I love braising duck legs or goose legs with a cassoulet. Or venison neck stew is really taste. Any kind of chili. For this recipe, you will need a cavatelli machine (or a wooden gnocchi board with lined grooves). Place all the ingredients into a mixing bowl and mix with your hands, adding water as needed, until the dough comes together. Transfer the dough to a table and knead until it is a firm, smooth ball. Cover the with a damp cloth or plastic wrap and rest for 30 minutes. Cut the dough into 6 equal-sized pieces. Roll each one into a log 1 cm thick and partially flatten into strips. Feed each strip of dough through the cavatelli machine while turning the handle. If you are using a gnocchi board, cut your logs into 1/2 cm rectangular slices and push the dough downwards onto the board, using your thumb to curl the dough and create a concave centre with grooves on the outside. Spread out the dumplings on a baking sheet, dusting with extra semolina to keep from sticking. Preheat a large skillet. Cut the vegetables into medium dice. Crush and mince the garlic. Season the venison meat generously with salt and pepper. Add the oil to the hot skillet and add the venison; do not stir until the meat is caramelized. Transfer the meat to a roasting pan and set aside. Add the vegetables to the skillet and sauté until they begin to caramelize. Add the garlic and stir; deglaze the pan with the red wine. Add the soft mirepoix to the roasting pan. Add the stock, bouquet garni and dried mushrooms, then cover the pan with foil. Bake at 325°F for 2 1/2 hours or until the meat is tender. Use a fork to pick apart into large pieces, leaving the meat in the liquid to cool. Fill one of the large pots with salted water and bring to a boil (pasta water should be seasoned to taste mildly like the ocean). While the water boils, mince the root vegetables. Tear the kale leaves off the stem and roughly chop. Heat a second large pot to medium-high and sauté the vegetables in the butter and olive oil until tender. Add the braising liquid, pulled venison meat and soft mirepoix to the sautéed vegetables. Reduce by half over medium heat. Once the water in the other pot comes to a boil, cook the fresh cavatelli for 5 minutes. Drain and transfer the cooked dumplings to the ragu, stirring with a wooden spoon. Add the cheese and cook for an additional 2 minutes. Spoon into serving bowls and top with additional grated Parmesan.